In a planet full of Trumps, MRAs and rampant racist nationalism, fighting the injustices in the World more often than not the last thing on any activist’s mind is making sure you’ve checked in with your own mental health and wellbeing. 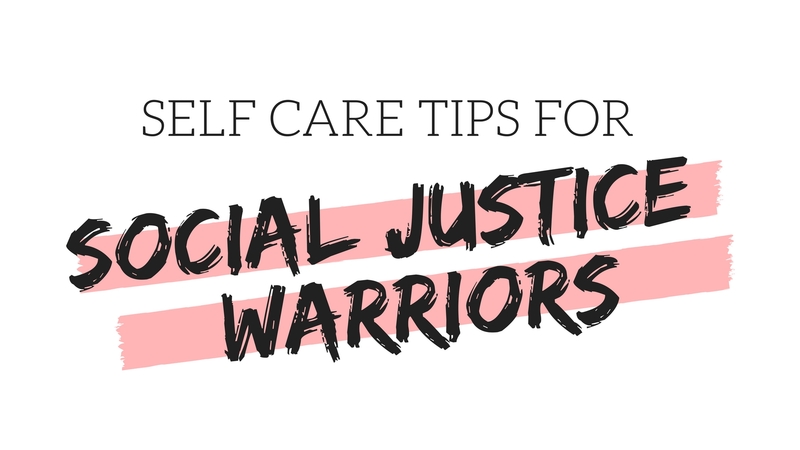 With so much bad in the world here’s how to look after yourself like the badass Social Justice Warrior that you are. Turning on the news or checking in on Twitter can feel as if we’re just getting an onslaught of awful in our faces. A lot of the time it feels like just as we take two steps forwards, there’s always another story that pushes us back. Progress can be slow and frustrating, but progress is progress. Even the smallest ripples of change are worth shouting about. Good news spreads positivty and hope, not to mention gives us a reason to keep fighting. People are always making awesome things if you look hard enough, so why don’t we turn words into action and actually support them? Buy what they’re selling, watch what they’re making, promote their causes, it’s all good karma when it comes to fostering a community of diversity. Personally I love stalking the #ladiesmakingthings, #ShineTheory, #RepresentationMatters and #PraisinTheAsian hashtags to find awesome positive stories from diverse sets of people. This point is usually easier said than done, but blocking hate is one step to cultivating a positive mindframe when carrying out activist work. Yes, there’s a time and place to educate and argue, but arguing all the time can be exhausting when you’re doing it on a daily basis. Rather than delving into arguments with trolls all the time try, block them and actively connect with others who share your views because goodness know you’ll need those people when you’re trying to remember that you’re not alone in your views on controversial issues. There is a point where it all becomes a bit too much and that’s ok. Burnout happens. Frustration happens. Sometimes we don’t win. But I want to believe you are trying your hardest, so it’s fine to take a break. Equally if you start to find yourself triggered by stories and articles online, please for goodness sake take yourself away from the Internet. Your mental health and wellbeing should always come first. So, those are my tips! Leave some of your own in the comments too.